XIDA releases a new Version of the App – Tap Touch Counter! Tap Touch Counter is a counter that let’s you easily track everything you want. 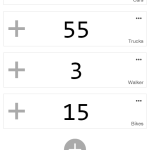 You can give each counter a name, save them for later and even use them again and continue counting in the future!